As a private preschool and licensed daycare in North Vancouver, we have recently joined the North Vancouver school board in providing child care services to those in the Queensbury Elementary school area. Our North Shore child care centre is a close-knit and friendly space that provides a fun, engaging experience for families in our community. After recently completing an extensive renovation, our new facility has become an amazing place to specifically foster education and exploration in children. We’ve dedicated a lot of local resources and care into creating an inspired space. We have two open classrooms, a patio, and even hand painted murals from Emily Carr students. 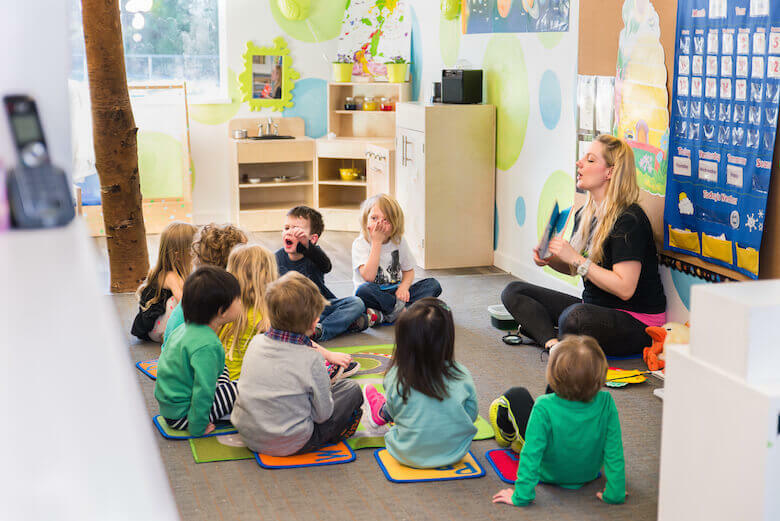 In our new open concept, you can join other parents in seeing your child be active, enjoy their educational lessons, and positively socialize with their peers. By choosing our neighbourhood child care centre, you can take advantage of a quality, local option for early child care. For the babies, toddlers and preschoolers, ‘quality’ means they will absolutely love coming to daycare. For the parents, ‘quality’ means that on top of having fun, your child will receive enriching, educational instruction that has been uniquely designed right here in Metro Vancouver. Read more about our program below! Our North Vancouver daycare centre is located on the grounds of Queensbury Elementary School. By being so close, your child will get a head start by familiarizing themselves with an elementary school setting. Not to mention, life will be easier for you with less driving to do! For example, children can begin with our all-day group daycare and preschool (2.5 to 5 years old) and then easily transition into kindergarten daycare by continuing before and after school care at Rainforest Learning Center. Inversely, parents with kids already in elementary school at Queensbury can have their toddler siblings only a few steps away while still allowing them receive school age child care in the same building, until you can pick them up later in the day. A good preschool curriculum addresses the needs of early childhood learners and spurs positive development. Children are active and eager to learn, and they deserve an active and exciting learning experience. The ‘emergent curriculum’ has recently become a highly talked about and effective way to go about early child care. We have found it beneficial to extract the spontaneity and fluidity of this daycare program, and pair it with other traditional pre-k methods. This kind of early childhood education gives kids an opportunity to positively develop social skills, brainpower, and creativity among their peers. Our custom child care programs are truly an ideal start to your child’s education. When your child attends our brand new child care centre, they will receive a unique mixture of preschool education and, well, FUN! Expect more than just nanny services. We introduce learning concepts early on in a fun and engaging way. Emphasizing healthy eating and nutrition with our group snack time. Children share fruits and vegetables they bring from home. Environmentally-centered activities like reusing and recycling that engage children in early social responsibility. Participation in ‘Buddy Days’ where children are paired with an older child to encourage skill building in reading, crafts, and games. Exploring monthly themes that guide learning. For example, a theme of ‘nature’ will have activities and excursions specifically designed around that theme (i.e. painting bumble bees, counting their stripes, visiting a ‘bug room’, etc). This encourages a well-rounded understanding of the topic. Bringing children on excursions that will broaden their view of the world. Places can include: a movie theatre, bowling alley, the beach, indoor fun zones, organized swimming lessons, and nature walks in our community parks. It is worth noting that our carefully structured activities and fun playtimes always keep your child’s learning abilities in mind. Whether it is by use of phonics or by demonstration, we are attentive to how each child is able to learn best. We give them the necessary attention that can be harder to come by in larger daycare and preschool companies. Benefit from quality child care at our North Vancouver daycare and preschool today! If you would like to arrange for a tour, or have any additional questions about our daycare programs, we would love to hear from you! Please call 604-880-0397 to find out more.